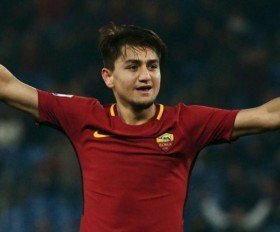 Arsenal are understood to have made a formal approach to sign Cengiz Under from AS Roma during the forthcoming winter transfer window. The Turkey international is widely regarded as one of the most promising young talents in the Serie A and his progress has caught the eye of some of Europe's elite. Tottenham Hotspur were recently deemed to have failed with a winter offer for the Turkish footballer and according to TMW, their north London rivals Arsenal are understood to have followed suit. As per the publication, Unai Emery's side are understood to have made an offer worth £29m for the attacker only to see the Giallorossi instantly rebuff their advances. It is added that the Serie A outfit want at least £45m for the upcoming star, although any transfer would have to wait until the end of the ongoing campaign. Roma are currently five points adrift of the Champions League positions and they are determined to keep hold of their star players to achieve the aim of finishing in the top four. Real Madrid make transfer decision on Christian Eriksen?